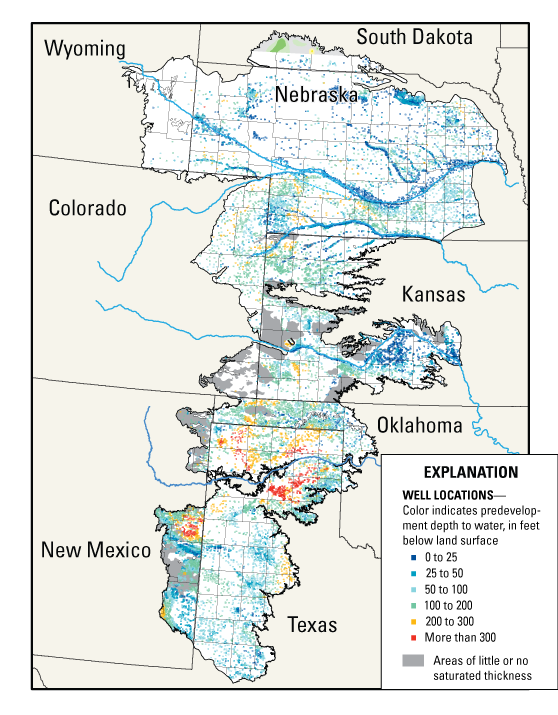 Assemble water-level measurements from the States that overlie the High Plains aquifer. Map water-level changes in the aquifer from predevelopment (generally 1950) or 1980 to winter or spring of the report year using water levels measured by Federal, State, and local entities. Map water-level changes in the aquifer for the last two years using water levels measured by Federal, State, and local agencies. Determine change in recoverable water in storage in the aquifer using the water-level data and estimates of specific yield. Report water-level changes and changes in recoverable water in storage to Congress and to the public every two years. The High Plains Water-Level Monitoring Study (HPWLMS) is the USGS response to a directive from Congress to report on water-level changes in the High Plains [Ogallala] aquifer. The directive from Congress was contained in the Water Resources Development Act of 1986 (Public Law 99-662). This law recognized the economic importance of the High Plains aquifer to the States in the High Plains region and added Title III to the Water Resources Research Act of 1984 (Public Law 98-242). Title III states that the USGS in cooperation with "...the States of the High Plains region is authorized and directed to monitor the levels of the Ogallala [High Plains] Aquifer, and report annually to Congress." The original directive was modified by the Federal Reports Elimination and Sunset Act of 1995 (Public Law 104-66). In this legislation, Congress directed the USGS to report on water-level changes in the Ogallala [High Plains] aquifer every two years instead of annually. Water-level changes from predevelopment to 2015, by well, ranged from a rise of 84 feet to a decline of 234 feet. Area-weighted, average water-level changes in the aquifer was a decline of 15.8 feet from predevelopment to 2015 and a decline of 0.6 feet from 2013 to 2015. Change in recoverable water in storage was a decline of 273.2 million acre-feet from predevelopment to 2015 and a decline of 10.7 million acre-feet from 2013 to 2015. Recoverable water in storage in the aquifer in 2015 was about 2.91 billion acre-feet. Water levels were measured in 3,164 wells for predevelopment to 2015. These results are available in USGS Scientific Investigations Report 2017-5040 titled "Water-level and recoverable water in storage changes, High Plains aquifer, predevelopment to 2015 and 2013–15." 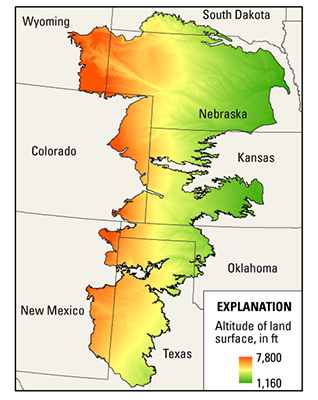 Boundary of the High Plains aquifer and land-surface altitude. The "predevelopment" water level in the aquifer is defined as the water level in the aquifer before extensive groundwater pumping for irrigation, or about 1950. The predevelopment water level was generally estimated by using the earliest water-level measurement in more than 20,000 wells. Depths to water in the predevelopment period ranged from land surface to more than 300 feet below land surface. Well locations and depth to water in the predevelopment period for wells screened in the High Plains aquifer. Animation: Water-level Change in the High Plains Aquifer System, predevelopment to 2011.